Kickstarter Alert: Help the creators of young adult comic 'Skeleton Bay Detective Agency' fund their first graphic novel – AiPT! Hi, my name is Cameron and if you’ve been reading AiPT! for awhile, you may remember a series of essays I wrote last year about starting out in the comic industry with a book that I write (from which I post a page a week online) Skeleton Bay Detective Agency. For the sake of my own ego, I chose to believe you all immediately went, “Oh yeah! Those were great pieces!” Just in case that wasn’t your reaction, here is the first part of this series, “Finding the Courage to Become a Writer,” the second part, “Coming Up With the Idea,” the third, “We Have an Idea … Now What?” the fourth, “I Went to Comic Book Conventions!“, and the fifth, “The Wilds of Self-Publishing”. In those essays, I mentioned the Kickstarter we ran in 2016 to fund a print run of a 12-page preview comic for our series. That Kickstarter was absolutely pivotal to the success we’ve had so far. Holding a copy of a comic book that I help make was more than a personal milestone; having the books has also allowed us to get our story out to people who we would otherwise never talk to. Our first Kickstarter was a big deal for us. Well, now we have another one. The comic itself is a Young Adult comic about the most inquisitive minds of Skeleton High School, who have come together to investigate the spooky goings-on of their sleepy New England town. It’s a tribute to goofing around with your buddies in the backyard on summer break, steeped in the tales told around the campfire, and infused with the urban legends whispered to one another late at night during sleepovers. More than just fun and adventure, though, it’s a story about facing fears. The kids face literal fears in the form of ghosts, but also come face to face with the self-doubt and anxiety of being a teenager. In a culture that feels so bogged down by “Serious Issues,” Skeleton Bay seeks to combat scary with spooky and instill in its readers a sense of excitement and play, friendship and hope, and that, yes, it’s OK to have fun. Additionally, we strive to keep diversity at the forefront of this project. We’re attempting to organically include as many voices in our cast as we can, allowing each one to be as fully realized as possible, and normalize stories that reflect the real world. We believe that many perspectives means a more dynamic story, and we want Skeleton Bay to be as dynamic as possible. The book strives to provide kids with something cool and resonant in the YA genre to either start them reading comics, or keep them going in the right direction. Despite an attention toward teens, though, this series is truly All Ages, so as much as it’s resonant to those going through puberty, it’s also fun for people fondly nostalgic for that time in their lives and the classic stories that paved the way for Skeleton Bay. Our world is unabashedly inspired by Scooby Doo, The Hardy Boys, The Goonies, Archie and all those great adventures too big for grown-ups, but we seek to use those familiar, archetypal story structures to tell real, resonant and respectful narratives. Skeleton Bay has a blend of adventure and mystery, contemporary young adult themes and nostalgic roots, so there is something there to charm everyone. To celebrate finishing our third issue, we’re raising money to do a print run of our very first graphic novel, which will collect issues one, two and three. It’ll be 80 pages in full color and will tell the first chapter of the larger Skeleton Bay story. It’s a great jumping-on point for the series, plus we have a couple of fun extras as rewards at higher tiers like gym shirts (but like, cool gym shirts). 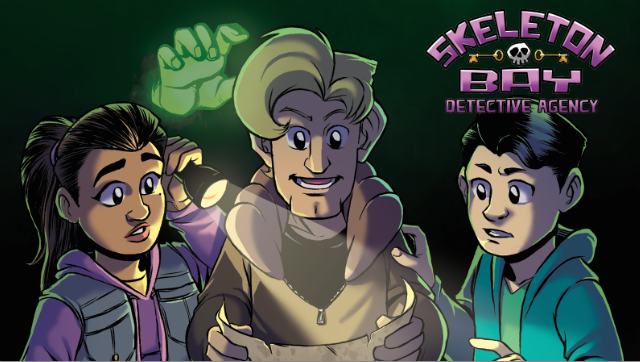 So, if you like spooky adventures full of ghost busting and best buddies, you like supporting independent creators attempting to fulfill a life-long dream, or you actually do remember what I wrote and like my style, then check out the Kickstarter for Skeleton Bay Detective Agency.